JMF Disco will provide you with a reliable, experienced Wedding DJ in Wadhurst to help with your special day. Our aim is to provide you with all the help you need for your wedding day, from your initial phone call to seeing your happy guests leaving after a wonderful nights entertainment, at your perfect reception provided by your Wedding DJ Wadhurst. Call or email JMF Disco for your Wadhurst Wedding DJ to find out how we can help you. Have a look at the Weddings page for more details of the Wedding DJ Wadhurst service we offer and call to discuss how we can help make your evening very special. We like to provide our clients with that little bit more - we provide them with what they want, need and deserve for their wedding reception in Wadhurst - it is a special occasion and should be treated as such. Doing it right requires a Wedding DJ with the right skills and resources that we will provide for your celebration. as well as your local favourite pub, club, hall or marquee in Wadhurst. Of course it is a legal requirement that Hi Ho Silver Lining is played at your wedding reception in Wadhurst as Jeff Beck lives in the area! We also provide great wedding DJs and wedding discos throughout the surrounding areas including Tunbridge Wells, Crowborough, Ticehurst, Burwash, Mayfield and Heathfield, Lamberhurst, Hawkhurst and Cranbrook. 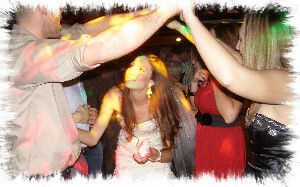 - We will provide you with the wedding reception in Wadhurst you really want!